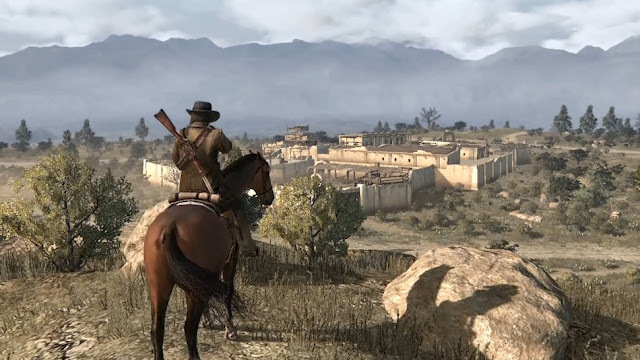 Red Dead Redemption is an open world 3D sandbox shooter developed by Rockstar New England,Rockstar Leeds, Rockstar North and Rockstar San Diego and published by Rockstar Games. Red Dead Redemption opens with a very calm tone and unlikely demeanor as the camera pans in to show us the view of a river port and an old car being lifted off a steam boat. already the things we see are already showing us the time we are in and we can identify the time or era that we are dealing with. the three men who disembark from the boat show us that they play a main part in the story as the camera focuses on them and shows us different angles of the characters. As the characters walk around the town a boy can be heard shouting the name of Bill Williamson who's gang was involved in an attack recently. the fact that the boy shouts this tells us that this plays a significant part in the story. As we see the man with a beard and hat board the train we can clearly identify that this will be the main character we will be playing in the game.As the character sits down for the train journey we hear two old women discuss politics and a certain man by the name of Nate Johns who is running for governor and who the ladies described as "Disgusting and Hillbilly trash". The women also speak of the corruption rampant in government and this also shows us the the old west is still outlawed with no rules. A young woman and a priest discuss religion but that a man in Kansas made a car fly and that soon people would be able to fly with the priest disregarding this fact saying "Only angels can fly". As the train stops the character enters the town of Armadillo. A small town where we are required to meet a man by the name of Jake to find Bill Williamson. A former friend and gang member who used to ride with John.As John arrives at Fort Mercer where Bill is hiding the two engage in a war of words where John exclaims to Bill that he is trying to save him. Bill refuses to join John and shoots john as John reaches for his weapon. John is later picked up by a young woman and her friend who we will later meet called Bonnie. In my opinion the intro is quite interesting and full of references of the time period. The background looks quite vibrant and nearly empty town adds mystery to the characters. The lack of dialogue until the train ride encourages the player to listen out and capture the other effects of the game. The intro receives a positive number from me. 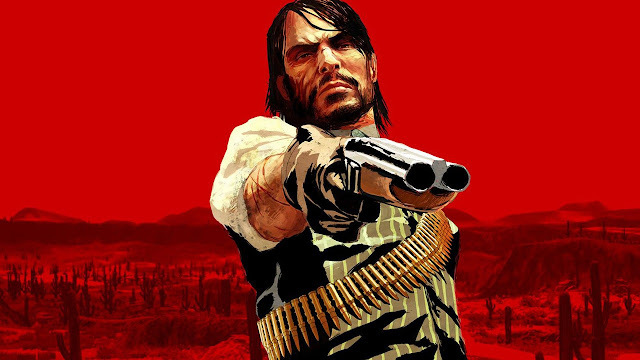 The story involves a man by the name of John Marston out to capture his old gang of friends known as the Dutch Van Der Linde gang. Johns family is held captive by the Federal Bureau agent known as Edgar Ross. John must find and capture his old crew which include Bill Williamson and Dutch Van Der Linde. John must use all at his disposal to bring them to justice or to kill them. John must travel all across the state of Austin and across the Rio Grande and into Mexico to find Javier Escuella and to also overthrow the local colonel Agustin Allende to help win the rebellion led by Abraham Reyes. My opinion of the story is quite good. I like the well designed character backstories to help build a better picture of the main story and to also help the player build a better picture of how things came about. I like the pace as you as the player can do the story line at any pace you want slow or fast. 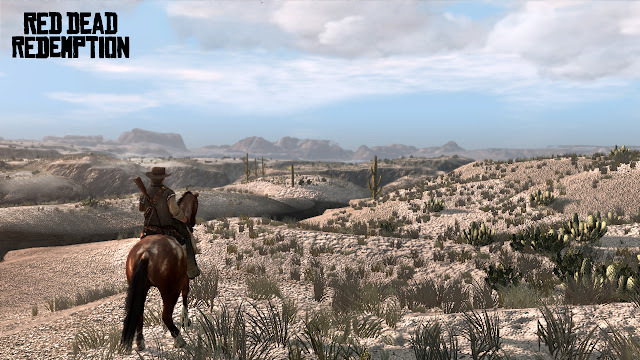 The large open world allows you to explore before you take on a mission and get a better feel for the game if you want. The main character entering Armadillo after disembarking from a train on the first mission. The objectives in the game are quite simple. Kill your enemies and capture Bill Williamson and DutchVan Der linde. Those are your main objectives. But you also have the mission objectives which depend on your mission which is well designed as heads up displays and brightly colored markers help you identify where to go and what to complete. These can range from capturing enemies on horseback with a lasso and bringing them to the local sheriff to helping people retrieve lost items to killing people. What i love is the simple approach to the completion of objectives and the heads up displays which help guide you to where you need to be. This is very well done in my opinion. 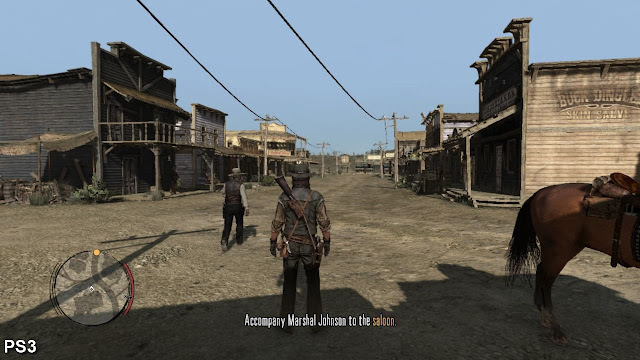 Gameplay showing the main character John Marston during one of the many missions in the game. The game play and controls are very good as the character easily moves but at fast pace but also can move at slow pace at ease. The ability to select weapons and your lasso is also well designed and makes it easy for players to access their equipment such as the ability to select double weapons or a single weapon such as a shotgun or a rifle. 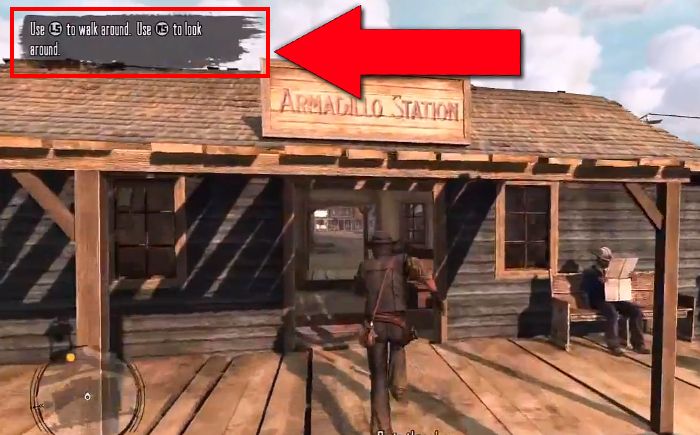 The dead eye system also helps players to access their gun and kill enemies with ease as it allows you to mark your targets much faster than usual. This is also a big benefit to players to completing the game. The ride able objects such as horses and wagons are also easily controlled and move with relative ease. In my opinion the controls are really good and easy to use with literally no difficulty. Another perspective view but this time of fort mercer. The graphics are put together very well and the color saturation can be changed in the options menu of the game. Everything looks to blend very well with almost no rendering issues. The lighting looks pristine with shadowing effects and texturing imitating real life such as grass,sand,mud and stones. The buildings are also very good as they almost look as if they were real stone cut houses or had real thatch roofs. Even when up close to buildings or grass or you can see no rendering issues or anything mismatching or out of order. The contrasting colors are also good and compliment each other very well. In my opinion the graphics are top notch and have been designed and rendered to a very high standard. 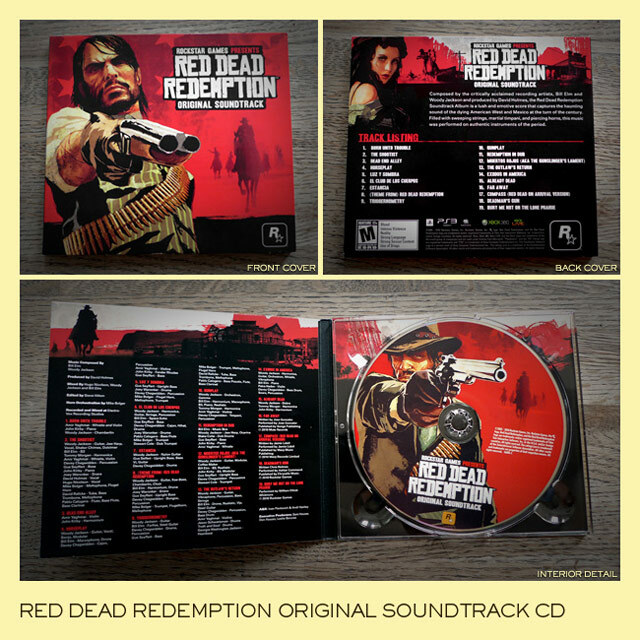 The soundtrack in the game is also good and and gives a dramatic feeling at times when the player comes across certain situations such as witnessing a robbery at a camp site,running from police,gunfights and chases. The music mellows out and becomes calm and ambient and relaxes the player as they roam the world map. This helps the player sense the other elements within the game such as the coloring,natural elements such as wind and sunshine and the music. In my opinion the music is well put together. Cover art of the game and also the front cover of the game. 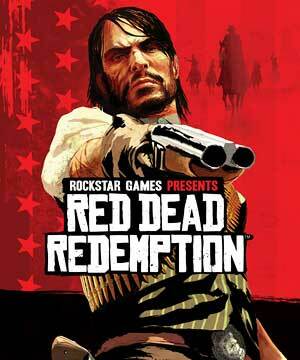 In my conclusion Red Dead Redemption scored very high as i have given it a 9/10 in terms of the intro,story/plot,game play/controls,graphics,audio and replay ability. The message this game tries to send is clear. We want you to live and breathe in the old west as our ancestors did and truly feel what its like to be a gunslinger. The open world is very diverse with a lot of missions to play and a lot of side quests such as poker and liars dice. The online mode offers many game modes to play in and many characters to pick from such as the hero John Marston and the villain such as Bill Williamson and past characters such as Red Harlow from Red Dead Revolver. The missions are replayable and can be accessed in the menu at any time. The online servers are also running 24/7 with a dedicated online payer base.Overall basing it on my evidence i give this game a 9/10. My opinion of this game is mostly positive and good. I think between the amazing graphics and the gameplay with the large game map and interesting story i think it is definitely a game to be remembered for a long long time to come.